Developing chronic kidney disease (CKD) could cause you a progressive and unstoppable loss of renal function over a specific timeframe. This rapid decrease in the functioning of your kidney would then lead to a series of symptoms such as feeling weaker, experiencing severe fatigue, and reduction in your appetite. People who are at risk of developing various kidney problems and those who have high blood pressure or diabetes are susceptible to this disease. According to research studies, people who suffer from this medical condition also experience higher mortality rates, as the functioning of their kidneys continue to decrease. Clinical studies have already enumerated the various causes of this disease. Such causes include hypertension or high blood and glumerulonephritis or the inflammation of small blood vessels in the kidney. People who have developed diabetic nephropathy, a medical condition caused by the angiopathy of blood vessels in their kidneys, are also susceptible to kidney disease. Vascular problems in the kidneys and the inflammation of the glomerular could increase the chances of developing kidney diseases because these medical conditions alter the functioning of the kidney. Kidney stones and even pin worms could also lead to the inflammation of the glomerular and complications in the small blood vessels of the kidneys. The best way to determine whether a person is suffering from CKD is to create a checklist of its symptoms and signs. If most of the symptoms in the list are experienced by a person suspected of CKD, then there is a huge possibility that he or she has really developed chronic kidney disease. As the functioning of the kidney decreases, the common symptoms of CKD subsequently emerge. These symptoms include increased blood pressure levels caused by the overproduction of vasoactive hormones, increase in uric levels and rapid accumulation of potassium in the human bloodstream. Increasing blood pressure levels usually lead to hypertension or congestive heart failure. 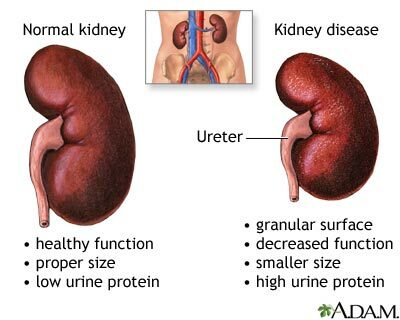 Meanwhile, accumulated urea in the body causes uremia, a medical condition wherein a person becomes lethargic and the fibrous sac in his or her heart becomes inflamed and sore. Lastly, accumulated potassium in the bloodstream, also known as hyperkalemia, could make a person experience fatal episodes of cardiac arrhythmias. People who undergo therapy for CKD usually aim to control the progressive decrease in their kidney function. The main focus of such therapies is to control the patient’s blood pressure levels and to treat the original causes of the patient’s disease. Substances used for the therapy of this disease usually include angiotensin converting enzyme inhibitors or substances that are antagonistic to angiotensin II receptor. These are the most important information you should know about CKD. If you want to prevent yourself from experiencing this fatal disease, you should take care of your kidneys and make sure that they are functioning at their optimal levels. You can take good care of your kidneys by adopting a healthy diet, quitting smoking and regulating your alcohol intakes. Once you have done these important management tips, you would become less vulnerable to chronic kidney disease.